this West End theatre hosts well-known musicals, including The Book of Mormon since 2013. The Prince of Wales Theatre is easy to access using public transportation. The nearest tube stations to the Prince of Wales Theatre are Piccadilly Circus (Bakerloo/Piccadilly Lines) and Leicester Square (Northern/ Piccadilly Lines)and Charing Cross Station (Bakerloo/Northern Lines). The nearest train station is Charing Cross Station. The Prince of Wales Theatre is serviced by bus lines 3, 6, 12, 14, 15, 22, 23, 38, 88, 94, 159, and 453. If you are driving to the Prince of Wales Theatre, the nearest car park is the Q-Park Chinatown. The Prince of Wales Theatre is a London West End theatre on Coventry Street, near Leicester Square in the City of Westminster. It was established in 1884, rebuilt in 1937, and extensively refurbished in 2004 by Sir Cameron Mackintosh, its current owner. The theatre should not be confused with the former Scala Theatre in Charlotte Street, off Tottenham Court Road that was known as the Prince of Wales Royal Theatre or Prince of Wales's Theatre from 1865 until its demolition in 1903. The first theatre on the site opened in January 1884 when C.J. Phipps built the Prince's Theatre for actor-manager Edgar Bruce. It was a traditional three-tier theatre, seating just over 1,000 people. The theatre was renamed the "Prince of Wales Theatre" in 1886 after the future Edward VII. Located between Piccadilly Circus and Leicester Square, the theatre was favourably situated to attract theatregoers. The Prince of Wales Theatre has a notable and illustrious past. The first production in the theatre was an 1884 revival of W. S. Gilbert's The Palace of Truth starring Herbert Beerbohm Tree, preceded by a one act comedy, In Honour Bound. This was soon followed by a free adaptation of Ibsen's A Doll's House, called Breaking a Butterfly. In 1885, Lillie Langtry, reputedly the first "society" lady to become an actress, played in Princess George and The School for Scandal. The first hit production at the theatre was the record-breaking comic opera, Dorothy, starring Marie Tempest, which was so successful that its authors used the profits to build the Lyric Theatre, where it moved in 1888. George Edwardes' musical play, In Town, often considered the first English musical comedy, was presented at The Prince of Wales Theatre in 1892 and was followed by Edwardes' even more successful A Gaiety Girl in 1893. In 1895, Basil Hood's Gentleman Joe, the Hansom Cabby began a long run starring the low comedian, Arthur Roberts, in the title role. The theatre then began to present straight plays with Maeterlinck's Pelléas et Mélisande (1898) and Wills's adaptation of Dickens' A Tale of Two Cities as The Only Way (1899, also starring Harvey). Charles Hawtrey starred in the successful A Message from Mars (1901). In 1900-01, Marie Tempest played the title roles in the play English Nell (based on Simon Dale's novel about Nell Gwynn), Peg Woffington, a dramatization of Charles Reade's novel, as well as Becky Sharp in a dramatization of Thackeray's Vanity Fair. The Prince of Wales Theate London then hosted plays such as Avery Hopwood's farce Fair and Warmer (1918) and Ivor Novello's The Rat (1924, Novello's first play, in which he also starred), and revues including A to Z (1921), Co-Optimists (1923), and Charlot's Revue (1924). They starred Gertrude Lawrence, Jack Buchanan, Beatrice Lillie, Stanley Holloway, and Jessie Matthews. Ms Matthews also starred, along with Richard Hearne, in "Wild Rose", featuring the memorable Jerome Kern song "Look for the Silver Lining". Beginning in 1932, the theatre presented a series of risqué "Folies"-style revues, including Voila! Les Dames (1935) and its last production, Encore les Dames (1937). These shows were so successful that they funded the rapid rebuilding of the theatre in 1937. After 50 years, the theatre's 800 seats were deemed insufficient for productions of the day, and it was demolished. On 17 June 1937, Gracie Fields sang to the workmen as she laid the foundation stone of the new Art Deco-decorated theatre, designed by Robert Cromie, and the theatre opened on 27 October that year. The newly rebuilt theatre's seating capacity was about 1,100, and it had a larger stage and improved facilities for both the artists and the public, including a large, stylish stalls bar (the bar itself was 14 metres long), complete with dance floor. The first productions at the new theatre were Les Folies de Paris et Londres, starring George Robey, followed by Folies De Can-Can in 1938, a continuation of the old theatre's series of successful risqué revues, which ran continuously until 2am every night. The musical comedy, Present Arms, was offered in 1940, and in 1941 the theatre screened the UK premiere of Charlie Chaplin's The Great Dictator. The film had been banned in many parts of Europe, and the theatre's owner, Alfred Esdaile, was fined for showing it. In 1943, Strike a New Note was notable for Sid Field's London debut, and he returned to the theatre in Strike it Again (1944), and yet again in Piccadilly Hayride (1946, a revue that ran for 778 performances). In 1949, Harvey, Mary Coyle Chase's comedy about an imaginary rabbit, was a success, as was Diamond Lil in 1948 starring Mae West. In the 1950s, the theatre hosted variety and revues, starring such famous performers as Norman Wisdom, Peter Sellers, Bob Hope, Gracie Fields, Benny Hill, Hughie Green, Frankie Howerd, and Morecambe and Wise. In 1959, Paul Osborn's The World of Susie Wong became the theatre's longest running play with 832 performances. Neil Simon's play, Come Blow Your Horn, starring Michael Crawford, played in 1962, followed by a season of Martha Graham's dance company, including the world première of her ballet Circe. Next was a string of Broadway musicals, including Funny Girl in 1966 with Barbra Streisand, Sweet Charity (1967), and Promises, Promises (1969). The Threepenny Opera was revived in 1972. In 1976, Bernard Slade's Same Time, Next Year was a hit, as was I Love My Wife (1977), and Bedroom Farce (1978). In 1982, Underneath the Arches was a long-running hit. Andrew Lloyd Webber's Aspects of Love (1989) smashed all previous box-office records at the theatre, running for 1,325 performances. More recent productions are listed below. Refurbishment was carried out in 2004 to increase the seating capacity slightly to 1,160 seats and to modernise the theatre's facilities. New bars were added, the auditorium completely rebuilt, the backstage areas refurbished and the theatre's famous tower and exterior completely gutted and refurbished with new LED lighting and a crisp modern finish. The theatre re-opened with, ABBA's musical Mamma Mia! on 16 April 2004. On 18 August 2007, Mamma Mia! became the longest running show ever at the Prince of Wales, overtaking the previous record held by Aspects of Love with 1,326 performances at the venue and counting. The production marked another landmark on Thursday 23 August 2007, celebrating its 3,500th performance since its 1999 world premiere at the Prince Edward Theatre in Old Compton Street, London. The theatre was grade II listed by English Heritage in April 1999. Where is Prince of Wales Theatre? 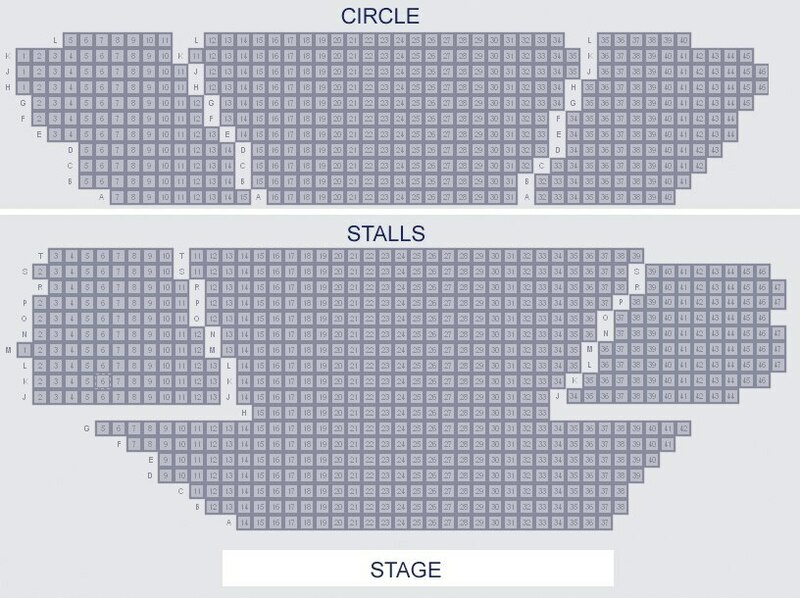 The Prince of Wales Theatre has a capacity of 1,160 across 2 levels: Stalls and Dress Circle.